Simply delicious cupcakes that are perfect for everyday or everday celebrating! the frosting is over the top yummy and it’s better than any traditional buttercream (American Buttercream) this is rich creamy and delicious. these are pretty enough for you fanciest celebrations or just decadent enough to enjoy after dinner. Each component is delicious on its own and combined together makes a triple delicious vanilla explosion! The filling is a custard cream filling is smooth and delectable. 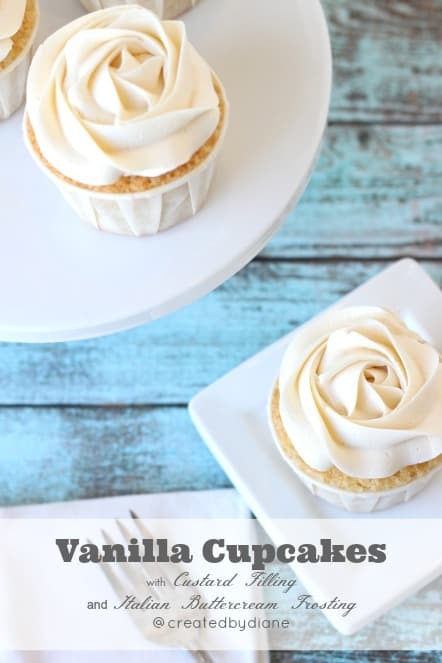 The cupcakes are topped with Vanilla Italian Buttercream frosting that is so silky, you may not be able to stop at just one cupcake, you have been warned! Have you ever eaten something and in one BITE and knew, you knew it was just like trying on the perfect pair of jeans. Without looking you knew they were the one pair you HAVE to have. Well, that sums up these cupcakes, but there is no hunting around from store to store and tiny dressing rooms to fit into here. Filled cupcakes are really my favorite, they have that added intrigue that is irresistible. 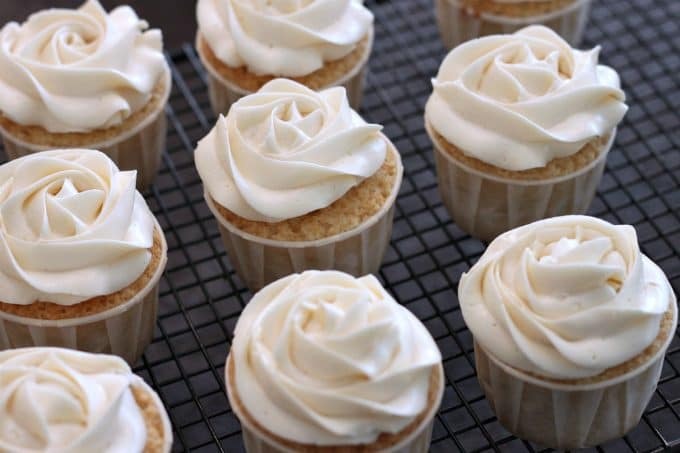 These cupcakes are decorated as white roses. Here is a link to my post on how to frost a rose cupcake with video. These would be perfect for anytime, bridal showers, baby showers, girls night out, birthday celebrations and anniversaries. These are my go-to cupcakes and I hope they become yours too! Vanilla: I get lots of questions about vanilla flavor. Yes, there is a huge difference in vanilla flavors on the market. I give names to the vanilla flavorings I use, you can google to see what they are if a link is not provided. If you are not “cooking” the item such as frosting or filling I use Orlando Vanilla click here it does not have a strong alcohol flavor and it really does make a difference. I’ve made many batches and had people sample the difference and it’s overwhelming what their response to different vanilla extracts/flavors. If it’s going into a baked or cooked item, the alcohol will burn off and you’ll enjoy just the vanilla flavor. I was sure to mention exactly the vanilla I used in each recipe that I LOVE, and hope that info helps when making a decision on what vanilla you’ll choose. I order items from baking supply stores online or find them at a local baking/cake shop. THIS is my favorite cupcake pan it bakes cupcakes nice and evenly without overcooking/browning them. THESE are my favorite cupcake liners, they are greaseproof and look so pretty on cupcakes. I use THESE piping bags and love them. In mixer bowl beat sugar with eggs until completely combined. Add flour, milk, butter, oil, baking powder and vanilla. In a medium bowl, mix sugar, cornstarch, and salt together, then add to it ½ cup milk and whisk smooth. Place the mixture into the saucepan and heat on medium low heat whisking until it comes to a boil and is smooth and creamy. This takes about 5 minutes. Remove pan from heat, stir in butter and vanilla. Place pastry cream into a bowl and cover with plastic wrap, allow it to cool 15 minutes, then put it into the refrigerator to chill. I've made this with salt and without salt, and also with salted butter and unsalted butter and even though I LOVE salty things, I find this recipe best with unsalted butter. Begin by separating the egg whites into the bowl that fits a mixer. Whisk the egg whites with 1 cup sugar until they form stiff peaks. in a small saucepan, bring the other cup of sugar and the water to a boil and allow the temperature to come to 245 degrees. Immediately remove the pan from heat and drizzle the syrup mixture into the whipped egg whites mixture on medium speed. Once you've added all the syrup bring the speed up a bit and mix until the bowl is cool to touch. About 8-10 minutes. Place the flat paddle blade onto the mixer. Add the butter one tablespoon at a time with the mixer on high. I drape a towel over the mixer so it doesn't splatter everywhere. Keep adding the butter while the mixer is going, continue to mix until all butter is incorporated and the frosting is smooth and creamy. If it looks curdled, or thin keep mixing. It may take a few more minutes to become thicker and smooth. Add in vanillas, then pour into a container with a lid. I guess I am pretty ignorant about things but would you share how you got the custard into the cupcakes? I followed the instructions on the filling, but it’s not creamy, it’s still very liquidy. It’s been in the fridge for 3 hours now… Parts are turning creamy, but it’s mostly liquid. How long is it supposed to chill for? It should not be watery. It should be a really thick sauce consistency when it comes off the stove. If it were me, I’d make a new batch to be on the safe side and you need to chill it until it’s completely cold. Chill in a shallow dish if you need to speed that process up, or you can always make the day ahead. It will be VERY thick when set up correctly. Oh they look so perfect! Irresistible! Your piping skills are very good 🙂 I should work on mine, I would take a classic vanilla cupcake like this anytime over any fancy pants dessert. The pastry cream is such a nice addition. That is one fantastic cupcake! I love that you’ve chosen vanilla. It looks so classy. It gives out that classic vibe, and I love swirls of the frosting. The cupcake is pretty irresistible! Do the cupcakes need to be refrigerated after being filled with the pastry filling? I left them at room temperature for 24 hours before putting any left overs in fridge. My advise is to fill the cupcakes and frost them as close to serving as possible. That taste best that way. If you refrigerate the cupcakes, be sure to let them come to room temperature before eating them. Thank you!!! I can’t wait to try the cupcakes this weekend!!! This is so beutiful. Must be delicious! i can’t wait to make these! How many does this recipe make? I believe 24 cupcakes, I am trying to locate my notes for this post. I typically have that info included and I’m not sure why it’s not at the top of the recipe, sorry about that. It is not a smaller batch, so anywhere from 24-36 is possible. Would this make a double layer cake as well? Are these cupcakes supposed to be mini size or regular size? For the frosting, is the sugar confectioner’s sugar or granulated? The frosting is made with granulated sugar. If you haven’t made Italian Buttercream frosting before it’s delicious! Made these today ….they were unbelievable delicious no left overs … The Italian buttercream was to die for … Will make these again ! Can you tell me on the vanilla… It says 2 teaspoons Madascar and one Orlando Natural Vanilla. Would that be 3 teaspoons total? It just says “1 Orlando”, so I’m assuming 2 teaspoon? And I’m not really sure what Orlando Natural is?? Thank you. These look amazing. 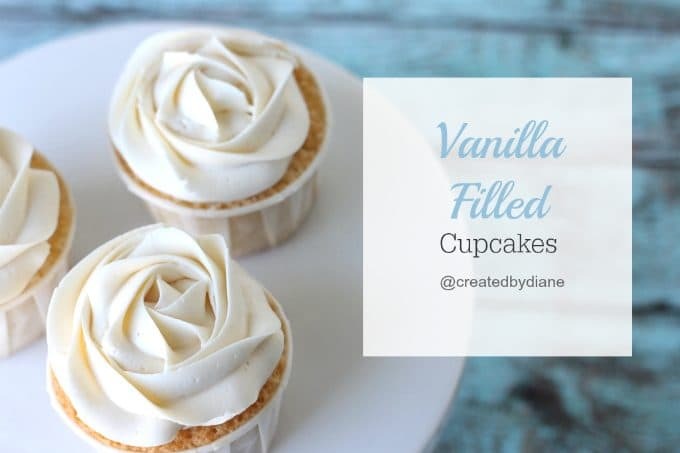 I used a variety of vanilla flavors in this recipe. 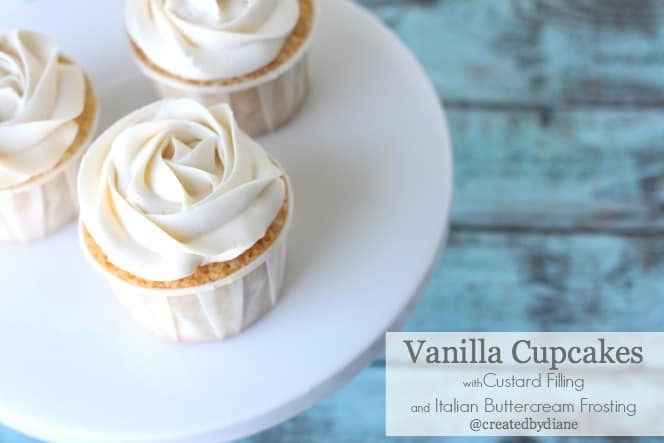 In the frosting use 3 teaspoons vanilla (use any variety you prefer, better tasting vanilla will produce better results) You can order Orlando Vanilla here http://orlandomx.com/shop/ It’s delicious, does not have a really potent alcohol flavor and is great when you are using it in items especially when they are not being cooked, such as frosting or filling. Is there a difference in what you purchase in a grocery store, yes absolutely. Hope you find a vanilla you love! 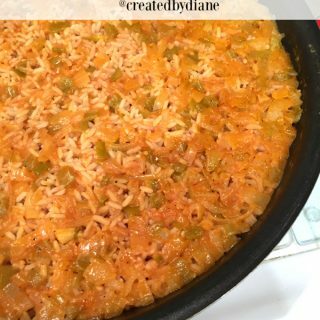 Hi Diane, i Just tried the filling recipe and it’s delicious…just have a question, I’ll use it as a cake filling not cupcake but I used to freeze my cakes with the fillings, do you think when it starts defrost might be watery, do you think it works for me? I’ve used the pastry cream as filling for cakes but have not frozen them. I think it will depend on how long you freeze it, a day or two probably would be fine, longer and I think it may separate (become watery) You can freeze unfilled cakes, keep the filling in the fridge and then assemble. Ok, Just freeze them from one day to another, I’ll have to try it, thank you so much!! I’ve used both with good results, but I typically make the Italian Buttercream with unsalted butter. The picture shows white cupcakes. My cupcakes came out yellow, not white. Given the 4 whole eggs, I can’t see getting white cake. The recipe is not for white-white cake/cupcake, it’s a pale yellow color when it’s baked and the top is more golden. The variation in color of the cake will depend on how yellow the yolks are, fresh eggs from “at home” chickens tend to be more golden and also it will depend on what the chickens eat. I use store bought eggs. I do have a “White” cake recipe if you would like to see it you can find it here https://www.createdby-diane.com/2013/10/oreo-cake.html The lighting on the photo of the cupcakes is bright, so maybe it appears brighter, but it’s a vanilla cake and pale yellow in color. How many does the recipe make roughly? Can I make the frosting 24- 48 hours in advance and pipe the day it’s needed? Making these for my niece’s birthday party (31st evening) and wondered if I could do the prep work ahead of time. I’ve already baked the cupcakes and made the filling- wanted to check on the frosting before I mess anything up. Thank you! yes, you can make the frosting ahead and pipe the day of. Awesome! Any special procedure to follow when taking out of refrigerator to pipe? If you refrigerate the frosting it will be cold as butter from the fridge, you may want to leave it at room temperature, then whip it up and then pipe it on would be my suggestion. Italian buttercream is different than regular buttercream which comes to room temp and can be piped, Italian buttercream may get grainy, I don’t refrigerate it before piping, I typically make it fresh. I would make it the day ahead and put it in a bowl, seal it and then mix it up and then put it into the piping bags and pipe the day serving. Just wanted to say that I made those cupcakes and they were a huge success… definitely no leftovers!! Thank you so much for your help Diane and a very happy 2017 to you! Happy they were such a success! Happy New Year. I need to add food coloring to this do you think it will effect the taste? I purchase food coloring from baking supply stores local and online and I do not think they add an “off” flavor. I like Americolor coloring. Hi, just wondering where you got your cupcake baking cups from? I’ve been looking for them everywhere! I bought them at a store called Smart n Final, they are non waxes nut cups. you can most likely order them online. Hi! Can I use vanilla extract in the cake batter instead of vanilla paste? yes, vanilla extract can be substituted for vanilla bean paste. I’m so happy to hear the recipes worked out well for you. They really are my favorites! When putting the filling into cupcake how much in each cupcakee? Also, do you put a part of the cupcake “plug” back in hole? I know sounds dumb but I have never done this beforre. Just add enough filling to each cupcake to barely fill the hole you made, and yes I do plug up the hole with the cake piece, just cut off the center area of the cake and use the top circle. This is fantastic! 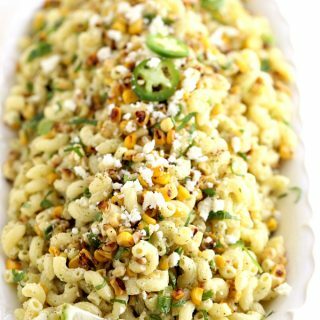 Not only tasty but so quick and easy to make. I practiced making these today for my grandson’s baptism in September. I loved the density of the cupcake! Also, your directions were very easy to follow! The buttercream icing was a little rich for me. I was wondering if you have ever tried making it with less butter. I was afraid to try it in case the texture changes. The Italian buttercream Recipe should not be made with less butter, it will affect the end result (not in a good way, I’ve tried it) Try whipping the frosting longer to lighten it up if needed. If you prefer American Buttercream here is my recipe, https://www.createdby-diane.com/2010/08/video-how-to-frost-a-rose-on-a-cupcake-in-20-seconds.html Also as with most baked goods like this you make them a couple days ahead of time, taste it again tomorrow. You may be surprised and like it. It’s a little buttery right out of the mixer, once the flavors set up you may prefer it. Unless you really like sugary frosting then go with the American buttercream, it’s more sugary tasting. You were absolutely right! The buttercream frosting had a different taste after it set up. I highly recommend these cupcakes! I’m so happy to hear you like it, it really is my all-time favorite frosting! Still cooling the custard but I just sampled a plain cupcake and it wad so delicious! Not too sweet, just perfect! There is no salt in your cupcake recipe. Does this mean salted butter should be used? Making them today for our first grandbaby’s shower! 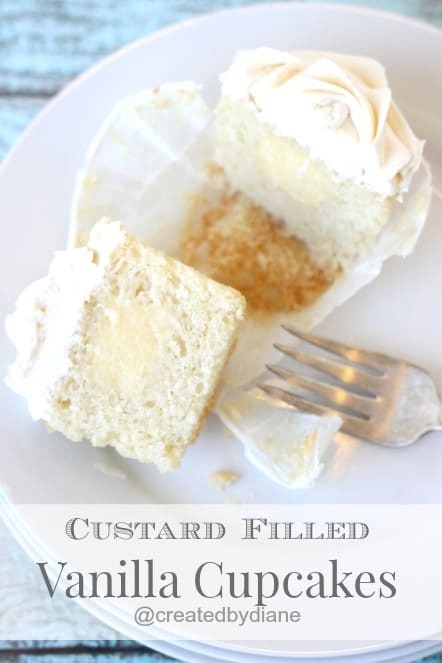 There is no additional salt added in this recipe, I use unsalted butter in the cupcake recipe and frosting. I will add a note in the recipe, thanks for bringing it to my attention that it wasn’t clear. Hi dear your cupcake look delicious and beautiful.I wI’ll be trying it soon .any suggestions if they will hold good for cupcake bouquet. Thanks for this recipe, it looks amazing! Can’t wait to make it. I’m trying to decide whether or not to use the Italian Buttrcream frosting – I confess that I do not have a candy thermometer (nor will I be able to get one before I make them tomorrow!) How critical is the 245 degree temperature? You can test the sugar mixture by placing a small amount into a cup of cold water and then removed, it can be formed into a hard ball. It will hold its shape but when squeezed firmly, it will flatten slightly. Used when making caramels. That is the best suggestion if you don’t have a candy thermometer. Be careful hot sugar syrup can burn you easily. Ask around maybe a friend or neighbor has a candy thermometer you can borrow since you asked if it was critical I’m assuming you haven’t worked with candy making and it really does need to be the proper consistency for the frosting to come out correctly. The Italian Buttercream Recipe is not what I would consider a beginner frosting recipe if you have worked with sugar syrups and candy making then it won’t be an issue, but yes the temperature is a critical element. Thank you so much for the response 🙂 I will see about getting a candy thermometer, otherwise will go with the regular buttercream. I’ve done a fair amount of baking, bur have never ventured into candy. I’d like to give the Italian Buttercream a shot though – expanding one’s horizons and all that. Thanks so much! Yes, you can frost the cupcakes a day ahead. You can put them in the fridge so they firm up a bit which makes them easier to handle before transporting and if your kitchen is hot from baking it won’t affect the consistency of the frosting. Allow them to come to room temperature for an hour before serving. (which is often the right timing to get them out of fridge, into a box and transport and place on table and serve) That will ensure you don’t mess the frosting up, they will taste fresh and delicious and are easier to transport then room temperature frosted cupcakes. 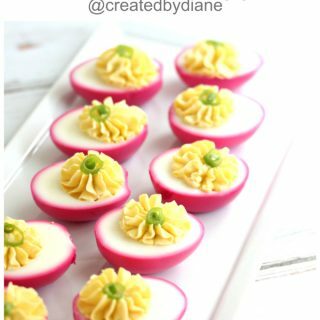 Making these this weekend, but I’m not doing the filling. I’m adding sprinkles and turning them into confetti cupcakes! Would these turn out the same if I used unsweetened vanilla almond milk instead of regular milk? I haven’t made them with any other type of milk if you regularly substitute that type of milk in baking then I’d guess it would be ok.